The eyes of the world are focused on a thin chimney on top of the Sistine Chapel. Underneath, ensconced in the papal conclave, 115 cardinals are due to make their decision as to who will succeed Benedict XVI as Pope. And the answer to the all-important question comes in the form of a simple smoke signal - no tweets or digital communication allowed - but will it be white or black smoke? So, when the Royal Society of Chemistry was contacted with a question on what goes up the conclave chimney, we turned to our very own holy smoke expert, Reverend Ron Lancaster, former chemistry teacher and founder of Britain's biggest pyrotechnic display company, Kimbolton Fireworks. As well as explaining some of the chemistry behind smoke production, Revd Lancaster says he's intrigued to know what the Vatican are using to colour the smoke that will herald the new Pope. "White smokes are easy chemically and often based on zinc chloride from hexachloroethane and zinc oxide. As for making smoke black, we're not sympathetic chemically to making the necessary carbon compounds - the principle of smoke production needs you to burn something, which unfortunately can have nasty environmental side effects. "The easiest way to create the black colour is to burn a carbon-rich organic material but it disintegrates in the air and tends to turn grey or white quite quickly. In the old days we used anthracine, but that's now thought to be carcinogenic, so they had to stop using that. They then started using naphthalene, which was used in mothballs - it's not damaging to humans but is toxic to fish. Whatever you're burning, someone somewhere doesn't like it!" 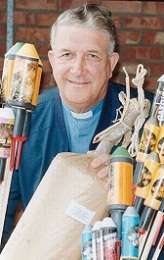 Reverend Lancaster spent 25 years as Chaplain and chemistry teacher at Kimbolton School in Cambridgeshire, founding a workshop conducting research into pyrotechnics which led to the creation of his fledgling fireworks company in 1963. He says while white smoke is going to be welcome in Rome this week, it is not always a welcome side-effect for pyrotechnics experts. "Smoke is often a nuisance to fireworks makers like me as it gets in the way during daylight displays or on a night with no up-draft. And while you can do some incredible things with coloured smoke as a screen, you really want the clearest possible view of the fireworks. "If I were involved in looking at making smoke at the Vatican, the question I would be asking is what colour it has changed to by the time it gets in air at the top of the chimney - and how many rehearsals they have had. "Maybe the chimney design is important - I can imagine they must have got hold of some pyrotechnic experts in Italy. But where they did the tests is beyond me!"